Santa John is Kris Kringle's official helper, and has been doing children's parties for friends and family for many years. Santa John has now branched out to bring the joy of Santa to everyone. As a graduate of the International University of Santa Claus, Santa John has his masters's degree in Santa Clausology, and is an official member of the Red Suit Society, a Charter member of IBRBS (International Brotherhood of Real Bearded Santas) and the Royal Order of Santa Claus. Santa John has also taken the Official Santa Claus Oath promising to maintain the true spirit and principles of Santa Claus. Santa John is a real beard Santa and has professionally tailored Santa suits made by the famed designer Adele's Of Hollywood. While attending class at IUSC, Santa John participated in the filming of an episode of The Discovery Channel's "How Stuff Works", which aired in December of 2010. Santa John was also featured in an Article in the Observer Dispatch December 25th 2012 "Playing Santa a way of life for Whitesboro resident". Santa John wishes to bring joy and happiness to all, and is available for children's parties, business events, family portraits, charity and non-profit group events, and many other activities. 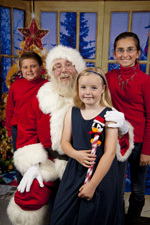 Santa John has activities and prices to accommodate any budget. If you do not see what you are looking for just ask Santa! Please look around my website and get to know me. You can contact Santa via this website or email Santa at snowbeltsanta@gmail.com. You can also contact the North Pole at 315 709 9783. One of Santa's helpers will contact you to arrange your event and discuss the many options Santa John can offer. Also please check out the calendar on the site to see what dates and times I have available.